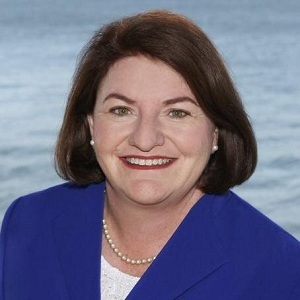 Speaker Toni Atkins (Credit: Twitter). California Assembly Speaker Toni Atkins is set to become the state’s first openly-LGBT governor today, but will hold the office for only a matter of hours, due to quirk in the state’s leadership this week. Ms Atkins will be the fourth governor the state has seen this week, as the position has moved from one Democrat official to another while the usual governor, Gov. Jerry Brown, is away on business. Gov. Brown left for a trade mission to Mexico on Sunday, and is due to return this evening. In his absence, the position moved to Lieutenant Governor Gavin Newsom until Tuesday morning, when he was required to attend a Special Olympics event on the East Coast. The next acting governor, Senate President pro tempore Darrell Steinberg, is scheduled to leave the state for Chicago this morning. As Gov. Brown is not due to return from Mexico until this evening, Speaker Atkins is due to hold the office in the estimated eight or nine hours between Mr Steinberg’s departure and Gov. Brown’s return to the state. In doing so, she becomes California’s first lesbian governor. Ms Atkins will be only the second ever openly-LGBT state governor across the US. In 2004, Gov. James McGreevey of New Jersey came out as gay, but immediately announced his resignation, to take effect three months later. As Ms Atkins has been appointed to the position, and as Mr McGreevey came out while already in office, no state in the US has yet elected an openly gay official to the position of governor. Democrat Representative Mike Michaud may be the first, if he succeeds in his bid for Governor of Maine later this year.